Normally you would probably want to do something a bit more complicated than that, but we’ll just keep things simple for the sake of the example. … and so on, up to 10 times. Well, the queuing of the setTimeout function and the for loop iterations happen “instantly”, or nearly so. 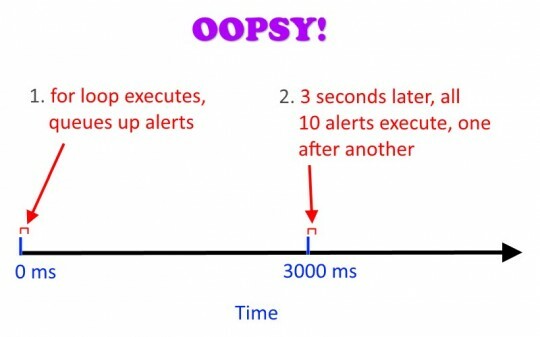 That means that within milliseconds, all 10 of your alert(“Cheese!”); functions are queued up and ready to fire – one after the other, about 3 seconds in the future. 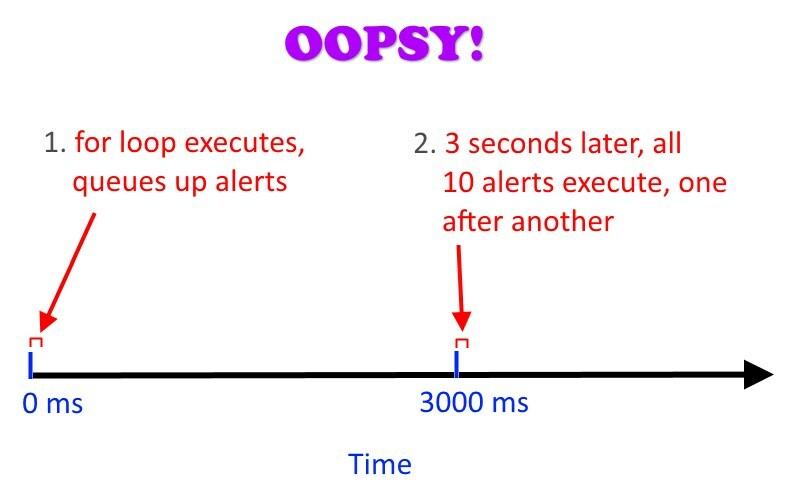 Instead of seeing 1 alert message every 3 seconds, what you get is a 3-second delay followed by 10 alert messages in quick succession! And that’s not what you want. So, what to do? First of all, we’re using a self-invoking function. The last line calls the function theLoop, and passes it the value 10 for i.
That’s exactly what we want: 10 alerts, and each alert pops up 3 seconds after the previous one. Awesome tutorial that made my day! Thought that was happening with the que but wasn’t sure how to fix. I kind of got it but it quickly turned into a mess in my head. As far as I got, the answer is ” Thread.sleep ” but I have a feeling it is not what I am looking for. Could you show me the direction to the Java way of this tutorial ? EEK!! I haven’t programmed anything in Java in a loooong time. I’m afraid I can’t help you there. Very well written and explained. Thank you!